CHAPTER TWELVE: WHICH DREAMED IT? 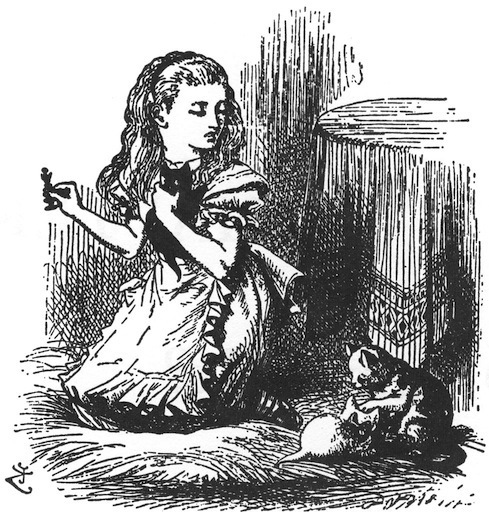 "Your majesty shouldn't purr so loud," Alice said, rubbing her eyes, and addressing the kitten, respectfully, yet with some severity. "You woke me out of oh! such a nice dream! And you've been along with me, Kitty  all through the Looking-Glass world. Did you know it, dear?" On this occasion the kitten only purred: and it was impossible to guess whether it meant "yes" or "no." So Alice hunted among the chessmen on the table till she had found the Red Queen: then she went down on her knees on the hearth-rug, and put the kitten and the Queen to look at each other. "Now, Kitty!" she cried, clapping her hands triumphantly. "Confess that was what you turned into!" "Sit up a little more stiffly, dear!" Alice cried with a merry laugh. "And curtsey while you're thinking what to  what to purr. It saves time, remember!" And she caught it up and gave it one little kiss, "just in honour of having been a Red Queen." "Snowdrop, my pet!" she went on, looking over her shoulder at the White Kitten, which was still patiently undergoing its toilet, "when will Dinah have finished with your White Majesty, I wonder? That must be the reason you were so untidy in my dream  Dinah! do you know that you're scrubbing a White Queen? Really, it's most disrespectful of you! "And what did Dinah turn to, I wonder?" she prattled on, as she settled comfortably down, with one elbow in the rug, and her chin in her hand, to watch the kittens. "Tell me, Dinah, did you turn to Humpty Dumpty? I think you did  however, you'd better not mention it to your friends just yet, for I'm not sure. "By the way, Kitty, if only you'd been really with me in my dream, there was one thing you would have enjoyed  I had such a quantity of poetry said to me, all about fishes! To-morrow morning you shall have a real treat. All the time you're eating your breakfast, I'll repeat 'The Walrus and the Carpenter' to you; and then you can make believe it's oysters, dear! "Now, Kitty, let's consider who it was that dreamed it all. This is a serious question, my dear, and you should not go on licking your paw like that  as if Dinah hadn't washed you this morning! You see, Kitty, it must have been either me or the Red King. He was part of my dream, of course  but then I was part of his dream, too! Was it the Red King, Kitty? You were his wife, my dear, so you ought to know  Oh, Kitty, do help to settle it! I'm sure your paw can wait!" But the provoking kitten only began on the other paw, and pretended it hadn't heard the question. The Hunting of the Snark: An Agony in Eight Fits will be coming soon. There are on-line versions available already of course, including this one hosted by the University of Adelaide, Australia. It includes scans of Henry Holiday's oddly sinister looking illustrations  but then again, the poem itself is oddly sinister. The scans provided as part of the Snark page on Wikipedia are far better, and rightfully labelled "feature pictures." An interesting point drawn out later in the Wikipedia article is the theme of identity loss and recovery through both Alice books and this poem. Carroll never seems to have discussed this overtly, yet its persistence as a theme suggests it was important to him. Alas, Snark seems to be the last of Lewis Carroll's truly inspired nonsense works, which nonetheless has a shiny-elbow feel to it. He was dealing with a death and a major illness in his family at the time, so an air of weariness is to be expected.